I started training at the Sheffield Dojo way back in 1991 when I was 8 years old. 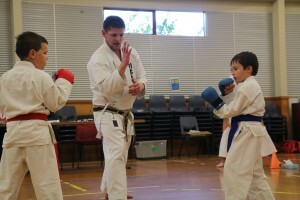 My instructor at the time was Sensei Peter Nicholls. A few years later the club merged with the Cust Dojo which at the time was run by Sensei Tony Foster. I was graded Sho-Dan (black belt) by Sensei Foster in 1998 at the age of 15. In 2000 I attempted my Ni-Dan grading which I unfortunately fell short in due to a knee injury. Due to my old job as an outdoor instructor / guide finding a Dojo was not always possible and this lead to a 4 year absence from regular training. In 2004 I settled in Wellington where I started training under Sensei Leo Donnelly which I continued until my return to Christchurch in late 2006. In 2014 I was graded to San Dan by Jundokan 9th Dan Masters Sensei Gima and Sensei Kinjo. 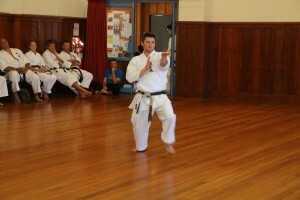 Earlier that year I relocated to Blenheim with my family and started the Blenheim Goju Ryu Karate club.